Where I Got It: My favorite thrift store in Melbourne, Florida where books are only 25 cents! The Historian is a monster of a book – it was extremely hard to sit down and write a review about it. My head was spinning with details and pictures for weeks after I read it. The story is, in short, about Dracula. More specifically about four people who search for his grave, but we still get a lot of info about Dracula and who he was in real life. In the meantime, these four people have researched extensively, or received hints, and believe that Dracula actually is the vampire that Bram Stoker made him out to be, and still alive somewhere in central Europe. The journey that they all take, separately, is full of plot twists, monsters, love, and heartbreak. However, the book can get awfully confusing really fast. We essentially have four different stories in four different time periods going on at once: Bartholomew Rossi’s (a professor), the narrator’s, the narrator’s parents, and Dracula’s. The majority of the story (I'm talking 300+ pages) is written in the form of letters and flashbacks, jumping sporadically from one to another in the blink of an eye. I'll admit that I skimmed some sections, then skipped a chapter or two entirely. The ending is very sudden, and I'm guessing is supposed to be a dramatic as well, but the way it was written is ho-hum. Not a satisfactory conclusion in my opinion. I find that it's so easy to bash books, yet harder to find the good deep inside. 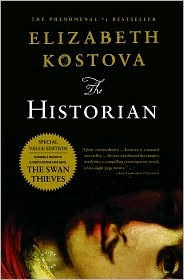 Elizabeth Kostova did A LOT of research for this book, and it shows profoundly. I learned a lot about Dracula, obviously, but also about the history of Romania, Bulgaria, and Turkey. I particularly like the narrator's (another character whose name we never find out!) point of view, but I felt she was almost completely ignored most of the time. I recommend The Historian if you are willing to set aside a big chunk of time to devote to the story. This isn’t light reading, you in sense actually have to work to read and understand the book. It's up to you whether you are up to the challenge or not, but I promise you this, the story will effectively draw you in and scare the crap out of you. 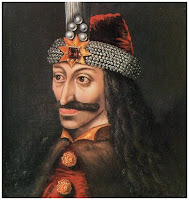 Vlad III, Prince of Wallachia, more commonly known as Vlad the Impaler, or simply Dracula. I gotta say, Edward Cullen’s got nothing on Dracula. Has Edward ever impaled babies onto their mother’s chests? Does he have that cool of a mustache? Didn’t think so. Great review. You are right it is easy to bash books, but when I attempted to read this on years ago, it's layout just angered me so much I couldn't get into it. I would really get in to one of the story lines, say the present time, and right when it really hooked me we would jump back to a different story that I completely didn't care about any more. I really think this book suffers because of this. You are right. This is a great, well researched book. But at the same time in my opinion, it takes spelunkers to find that book. I bought this a couple of years ago as a bargain book at B&N, hardcover. It intimidates me! I want to attempt it, but I figure I can get other books read quicker. I loved this book and read it in a day and a half (I have to admit it was during a holiday period, but still). I really enjoyed learning about Dracula and all the other history incorporated in the story. But to me it was really annoying not to know the name of the narrator, bothered me throughout the book. Great review! I read the beginning of this book a while ago when it came out; then one night, I put it aside and... kind of forgot about it. I guess it hadn't caught my attention, or maybe I wasn't ready to devote time to it, like you said. But I'm thinking I should definitely give it another try! Love the review! I liked it more than you did (I adored it), but it did take me four months to read. The size was so intimidating! It's actually a book I've been meaning to re-read.